Segger has announced the tool last week (see https://www.segger.com/systemview.html). It works both bare-metal (no RTOS) and with using an RTOS. The V2.10 release on the web page includes support for the Segger embOS. When I contacted Segger about the possibility to use it with FreeRTOS, they provided me with their first FreeRTOS port (V2.11) (MANY THANKS!!!! ), and I was able to get it quickly up and running and integrated both with Processor Expert and Kinetis SDK :-). 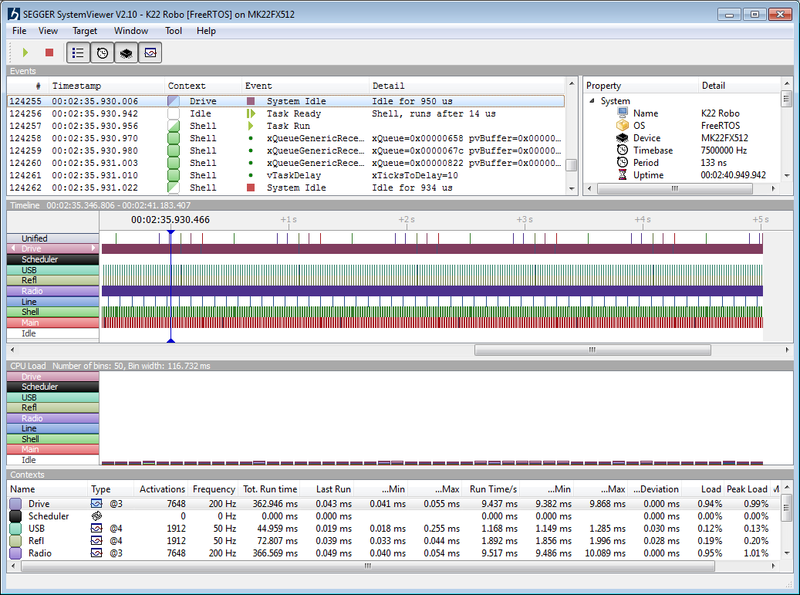 The Segger SystemViewer is based on Segger RTT (see “Using Segger Real Time Terminal (RTT) with Eclipse“): all what it needs is a few functions on the target which communicate to the host over the Segger J-Link debug connection. It is super fast and provides the ability to collect almost unlimited trace data. 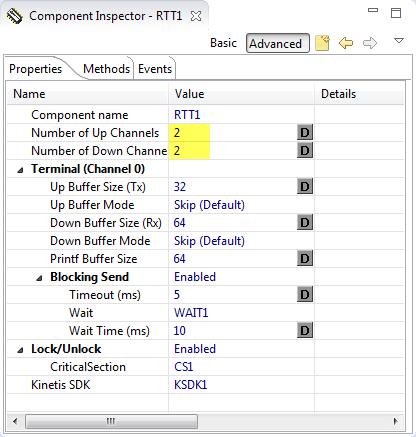 To make usage of RTT and SystemView very easy for any Kinetis devices, I have created special Processor Expert components: one for RTT and one for the SystemView. 💡 I have it working well on ARM Cortex-M4(F). The implementation for ARM Cortex-M0+ is still experimental! The easiest way is to use it with a Processor Expert project (with or without the Kinetis SDK). You can enable/disable SystemView for an existing project as well. 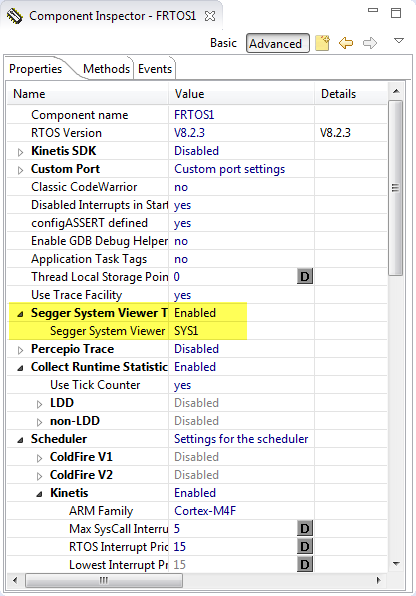 Finally, in the FreeRTOS component I enable the Segger System Viewer trace. This will add the necessary trace macros to the Kernel to write all the trace data information. is set to 1 in FreeRTOSConfig.h. The SEGGER SystemViewer has several views which give me insights what is going on. The problem was that the USB SendDataBlock() method was waiting without a timeout as long as a transaction is going on. In the case of a USB communication problem, this results in a very long blocking time. Wow, I’m really impressed! The Segger SystemView is a true treasure for any embedded developer: it collects incredible useful data from a running system, free of charge. All what I need is a Segger J-Link or a J-Link enabled board. I plan to release the updated Segger RTT and Segger SystemView support with the next McuOnEclipse component release. If you would like to receive the components in the current experimental state, drop me an email (see About) and I’ll help you out. Otherwise simply clone my repostory on GitHub. PS: I would like to thank the company Segger for their support last week to get the Segger SystemViewer running with FreeRTOS! This entry was posted in ARM, CPU's, Debugging, Eclipse, Embedded, Embedded Components, FreeRTOS, Freescale, gcc, KDS, Kinetis, Processor Expert, SDK, Tips & Tricks and tagged arm gcc, Debugging, Eclipse, Embedded Component, FreeRTOS, Freescale, gnu gcc, Kinetis, Kinetis Design Studio, Kinetis SDK, Processor Expert, Segger, technology, Tips&Tricks by Erich Styger. Bookmark the permalink. Could you explain in greater detail the “Example” i.e. the issue (code snippet) and the fix? Sure, I have updated the post with the details. I hope this is useful. Does it work also with MQXLite, do you have experience with it? Currently only FreeRTOS, embOS and bare-metal are supported. I would like to point at our original tracing tool for FreeRTOS, embOS and other RTOS, Tracealyzer. This is officially supported by FreeRTOS, also available in a free version, also supporting Segger RTT (but not locked to it), and with a lot more visualization features. Frankly I quite surprised that SEGGER has developed SystemView since we collaborated on Tracealyzer for embOS. SEGGER will release V2.12 some time this week, probably Wednesday. We are currently performing more tests and some improvements on usability. or even bare metal, simply visualizing the ISRs, which can already be quite helpful. There will be an Application Note on the website explaining how to port any RTOS. We are also open to work with other vendors of RTOSes. By the way, it does not require J-Link. J-Link adds extra value: the real-time acquisition as well as the unlimited trace buffer. can read the data faster than it is typically produced. We find a typical production rate to be around 10.000 Events/second, with about 70KB data /sec. can be saved to disk and read and visualized by SystemView. the future to verify that their target system behaves as expected and to find and eliminate problems, helping to make embedded systems safer. Is there something extra to get this working? 1. Configure and initialize SystemView (SEGGER_SYSVIEW_Conf or SEGGER_SYSVIEW_Init). 2. Start recording on the target (SEGGER_SYSVIEW_Start). 4. Get the RTT buffer address and the number of bytes used (Normally _SEGGER_RTT.aUp.pBuffer and _SEGGER_RTT.aUp.WrOff). 5. Save the number of bytes from the buffer to a file. 6. Open the file with SystemViewer. In step 5 make sure to only save the memory which has been filled and not the whole buffer. This is usually less than the whole buffer, since SystemView only stores complete packets. Might it be possible that you saved the whole buffer? This can cause a crash which we will fix, but it might lead to garbage data at the end of the recording. Otherwise, could you provide your recorded data? I could only reply here. Thanks a lot for reassuring. I gave it another try, and with this dump it now worked out. Must have taken the wrong addresses in the previous attempt I guess. Thanks a lot Johannes, for your reply. which tool did you use to take the dump and save it on file ? i am using eclipse. which plugin i have to install to take memory dump ? Segger released version 2.20 for WIndows. Thanks for the note, I will integrate the v2.20 and push on GitHub hopefully by tonight. and Mac OS and Linux builds! on the weekend I had some time to test the Segger SystemView tool, and I say wow this is really great stuff. I had issues to get it firstly run in my FRDM-K64F system, but after I updated the JLINK package to JLINK_V510d and JLINK Firmware to JLINK_OpenSDA_V2_2015_10_13, SystemView works as described. I got fantastic deep insight in my running FreeRTOS system. Additionally to the task switching I wanted to see also the interrupts, which trigger my tasks. So I put the API functions SEGGER_SYSVIEW_RecordEnterISR() to the beginning and SEGGER_SYSVIEW_RecordExitISR() on the end of the specific interrupt handlers, which were on my focal. 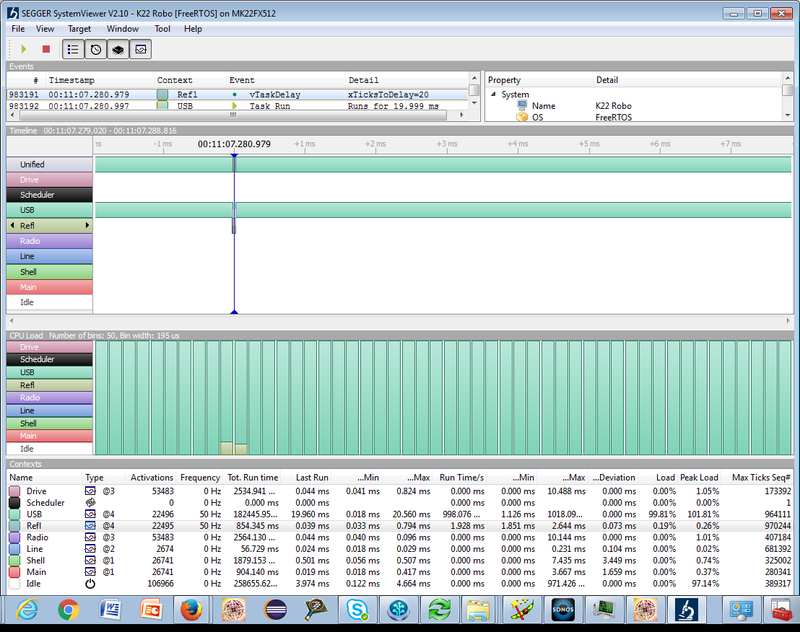 It runs perfectly now and I see additionally the interrupts, which signal the task switches. I find these two important API functions would be good to have additionally in the SeggerSystemView PE component interface. no surprise to me that you find the Segger SystemView useful: it has been very, very useful for me too :-). first of all congratulations to your amazing blog. Do you know if there is any kind of step-by-step instruction available to get SystemView running without using your Processor Expert Components? no, I don’t have that at hand (I’m terribly behind with many other articles). But actually that should not be too complicated. Maybe I can find some time the next weekend, but you know, I should finish first that other article about how to use FlexIO…. I spend a view hours of the weekend to get SystemView running with FreeRTOS, not using Processor Expert. The steps needed to get it working have been quite simple. I have the system viewer working using the files from the SystemView installation (not the PE components) and is sort of working. I put my application to run and it runs properly. As soon as I press “Start Recording”on the SystemView Application it starts to record and after a couple of seconds my code start to behave erroneously and it gets stuck in the IDLE task. I don’t know what could be wrong and I haven’t found any solution to this. Do you know what could be? maybe I’m configuring something wrong. RTT Control Block Detection — Auto Detection. I wonder if these configurations are correct. I think you face some kind of interrupt or stack overflow problem. In my recent version of the SystemViewer I had to fix a problem with the interrupt priorities (critical sections). You might have a look at me commits on GitHub: basically you have to make sure that RTT is locking up to the RTOS blocking interrupt level. I have copied my code below. The SEGGER_RTT_Conf.h has a define SEGGER_RTT_MAX_INTERRUPT_PRIORITY to set the lock level. As Erich wrote, this can be changed according to your FreeRTOS/System configuration. The default is 0x20, which in your case should be good, locking interrupt level 2 – 15. Another thing you could check is that the task stacks and the interrupt stack is large enough to generate SystemView events. With the default configuration recording requires a maximum of 230 bytes on the stack. I noticed something, if I leave the SystemView window minimized or behind another window in my PC, or in other words is not visible, then everything works fine. But as soon as I bring the window to the front the MCU application stops working. I don’t know if it is doing something special but is not behaving correctly when maximized. If it is minimized it collects data perfectly and both SystemView and the MCU work well. As soon as I maximize it the MCU stop working. Then If I go to review the data everything is there, nothing is lost. Is not that I have a useless SystemView, it works just fine when minimized, it’s just annoying that I have to minimize it every time and I wonder why could this be happening and I don’t know if anybody is experiencing something like this. SystemViewer should behave the same when minimized as when it is visible. On which OS are you running SystemViewer? How does the MCU stop working? Does it get a HardFault or any assertion? There is no hard reset, no assertion or fault, the execution just get stuck in the IDLE task. I don’t know how this could happen but the tasks cease to execute, the mcu still works but no task is now given time to run. I’m using a simple Task A-Task B example to use SystemView for the first time, is basically the fist example in the FreeRTOS PDF. 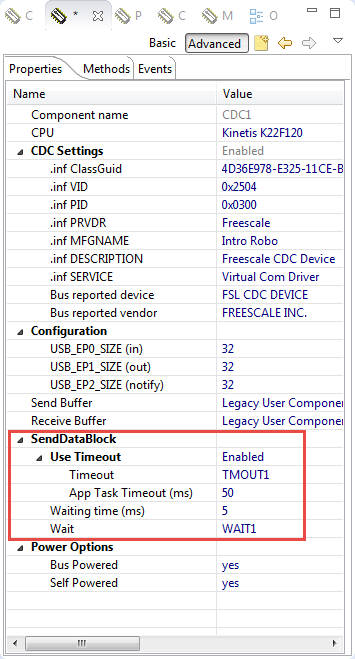 could you check when you are in that idle task, if interrupts are still enabled? Check the BASEPRI and PRIMASK registers. BASEPRI and PRIMASK registers are always 0. But looking at the data in systemview after it gets stuck into the idle task I observe that every once in a while there are “holes” in the data visualized, I mean, I can see the SysTick every 1ms and my tasks executing every 10 ms but suddenly right after my tasks execute instead of seeing the SysTick again I see in the “Events” window in the Context column it says “IDLE”, on the Event column it shows “*** OVERFLOW ***” and in the Detail column can be read “TotalDrop=51” (or other different amount) and anything is visualized for about 20ms, then everything goes back to normal and after about 120ms aprox I observe the same situation. This continues until it no longer recovers and gets stuck in the IDLE task. The moment when it gets stuck I can see the *** OVERFLOW *** showing something like TotalDrop=4870 or some really big number like that. Finally after this event the Systick remains constant forever but the system is already stuck in IDLE. Can you try to increase the RTT buffer size? It looks that your communication is too slow. Otherwise try to increase the swd clock speed in the jlink settings? I have increased the RTT buffer size and nothing happened. I tried also to increase the speed of the J-Link and nothing happened. The only thing that seems to have helped a little was to increase the “configMINIMAL_STACK_SIZE” from the original “90” to “256”. I don’t really know why increasing from 90 to 256 the “configMINIMAL_STACK_SIZE” parameter helped since this configuration is just for the stack that the IDLE task uses (for which I don’t have any hook). Also the *** OVERFLOW *** event does not necessarily happens when switching to the IDLE task, it can happen any time. Usually all other tasks are using the configMINIMAL_STACK_SIZE as a base. So this would affect all tasks. 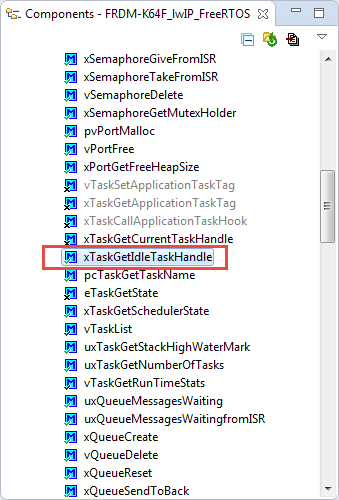 Check the task size parameter you are using for each task. If not using configMINIMAL_STACK_SIZE as base, increase the task stack size of each task. The other important thing: on ARM interrupts are using the MSP (main stack pointer), and the tasks are using PSP. What is the stack size in your linker file for the ‘main()’, after reset? Increase that to at least 0x400 bytes. I have increased the two tasks stack size to configMINIMAL_STACK_SIZE * 2 and it continues behaving the same. And I assume that the stack size is 0x400 already based on the “STACK_SIZE” assignment, but I think I don’t understand quite well how to check the ‘main()’ stack size and I don’t know how to increase the whole system stack size (if I would have to do so). it would use __stack_size__ if this is somewhere defined in your application. to be sure that you have 1 KByte of interrupt stack (and for main()). We at SEGGER could have a look at the issue. For completeness: The problem has been solved via e-mail. The limited performance of the OpenSDA J-Link (due to hardware limitations, no J-Link firmware limitations) caused overflows when too many events were generated. Solution: Disable API or ISR event recording in SEGGER_SYSVIEW_FreeRTOS.h or use an external J-Link. thanks for posting the conclusion, appreciated! another reason might be that the J-Link OpenSDA does not support SWO. This is not that relevant since RTT is supported, but anyway a disadvantage. did you see this before ? I have not seen that, very interesting, thanks for providing the link. I see there is a free version, not sure how useful that one is. Have you tried it out already? I’m focused on an other task. Just saw the website written in a source code file I was working with. this offers features no commercial IDE I know can provide. iSystem tries hard to ingegrate mixed domain information in their debug view, too. I would really prefer a eclipse based solution with all the known-to-work plugins and the benefit of a good-enough editor. I have installed the plugin into KDS, and I’m impressed! For now I have loaded a trace file, and this really looks impressive! Maybe not as easy to scroll as in the Segger application, but overall really looks cool. I think I have to explore this more! Thank you so much for that hint! This is actually pretty awesome! Impulse can be used with SystemView as a [a real-time recording and visualization tool that visualizes the runtime behavior of embedded applications]. Also Impulse can be used with “The sigrok project” to visualize data from logic analyzers and oscilloscopes in eclipse as well!! nice to hear that you like impulse. IF you have any problems and ideas, don’t hesitate to contact me. (thomas@toem.de). I still think that impulse is not that strong in the embedded area due to bad debug target integration. Current focus is on establishing raw conntections (like rtti) and improve the current trace fromat (flux project will be the next step). Would be great to hear from you. I very much like impulse. What is not so good (yet?) is the zooming/mouse scrolling support. Have a look at the Segger SystemView application: this one makes it really easy and fast to deep dive into the data. Maybe something you could consider (using the mouse scroll wheel)? Mouse wheel is supported, use Ctrl to Zoom (Shift for smoth hor. scroll and no key for vertical). Scrolling is easiest by clicking and moving a cursor or the domain axis. I had now more time to use the latest version in Eclipse. Yes, scrolling with the mouse wheel works with shift, not zooming with Ctrl. Let me know if you are interested in some other feedback. That tool looks very promising, but it seems there are still some rough edges at least with FreeRTOS and Systemviewer support. any feedback would be great! Would guess that >50 % of all improvements so far were based on user replies. Its sometimes difficult to be a tool developer and user at the same time ! You may use: thomas (at) toem.de. perfect, I’ll get in touch with you! yes, you can use it in ‘post mortem’ mode, see https://mcuoneclipse.com/2016/04/03/mcuoneclipse-components-3-apr-2016-release/. I ran into a problem with using the post mortem buffer. I pulled the newest versions on github and sourceforge and ran into the same problem. Looks like the SystemView sources in the KSDK are not up to date. I got it to compile with my SEGGER_SYSVIEW_RTT_CHANNEL at 0 or 1. Yes, this is what the post-mortem mode of SystemView is made for. You start recording explicitly in your application. When the system hangs you start SystemViewer and use Target -> Read Recorded Data to get the last events recorded on the system. There will also be a future version which allows recording more than 1 000 000 events. after some help from Erich (thank you!) I have this working now on my target system. Thought I’d mention what it took to get it there for others. This set of instructions is getting long in the tooth at this writing so there are a couple of other things you need to do. When using KDS and PEx at least (I expect CW is about the same) you have to check the “Use Trace Facility” in addition to using the Segger bean and turning it on, both of these in the FreeRTOS bean settings, to actually get this to compile and run. Next you need to make sure that the DLLs for J-LINK drivers (on which SystemView depends are set up to the most recent (at this writing it is 6.0).. these DLLs need to be in both SystemView and KDS (which the installation for them will ask you about). SystemView 2.40 was just giving a cryptic message of “Can’t find the RTT control block” or something like that. Changing out the DLLs made it run correctly. Seeger people if you are listening: It would be good to note the wrong DLL version to the user I’m thinking. thank you for summarizing these points. 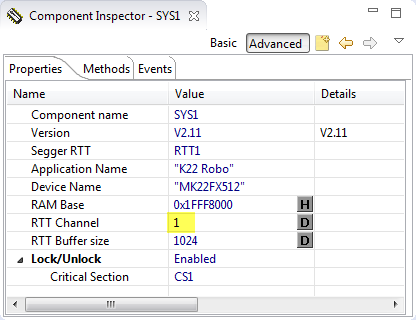 SystemView depends on actual Segger J-Link DLL’s. It is not enough to have them inside KDS: SystemView looks up in the folder where it is installed for the J-Link libraries/DLL’s. So it is important to have both the Segger J-Link and the SystemView setup installed and the files installed. The J-Link setup will update all the DLL’s of the toolchains it can find (at least on Windows), see https://mcuoneclipse.com/2015/08/30/updating-segger-tools-in-eclipse-kinetis-design-studio/. Hello Eric, thank you for this amazing post (also many thanks to Segger). This software is really useful. I’ve been able to set it up but I observe some strange issues. Sometimes the tasks and ISR names are not resolved, by example instead of TaskName I would see Task 0xc28, or ISR #33 instead of RTC1. Have you already faced this kind of problem ? Note that I don’t use a Kinetis MCU, nor your plugin or Processor Expert, that’s more of a general question. the ISRs are always reported with the interrupt number and not with a name (at least on my side). If the task name is not properly reported, then probably this is an issue with your FreeRTOS port. It means that the list of tasks with names is not properly sent to the RTT and SystemView. I have patched this in FreeRTOS (see as well the patch Segger provides), but I believe in my port of FreeRTOS I tweaked it a bit more (not sure any more) to report the names correctly. But it could happen that the names are not reported if you record something in the ‘middle’ of a stream/session too, but the task names should be sent some time afterwards. The ISR names have to be given in the system description, e.g. I#15=SysTick. Have a look at your SEGGER_SYSVIEW_Config_[OS].c, where you can add the description for the ISRs you use. Task descriptions are usually provided by the application/OS. thanks for the tip about the descriptors, I have missed that! Hello Johannes and Eric, thanks for answering. Eric, does the fix you mention is the one about adding tracePOST_MOVED_TASK_TO_READY_STATE ? I didn’t have this in my code, I’ve just added it as it is in your Github project, but I still have the same issue. Johannes, The ISR as well as the tasks name are given in these files (The ISR names do not come from the FreeRTOS configuration file but from another one), indeed half of the time the tasks and ISR are correctly displayed in SystemView, but the other half of the time only their number is displayed. I think Eric is correct when he says that these information may not be sent in the middle of the stream, and it would match my usecase : The application is already running when I start the SystemView recording. I was looking for a better replacement for Lauterbach. No, Segger does not support PowerPC (https://www.segger.com/downloads/supported-devices.php). I have used P&E (http://www.pemicro.com/products/products_find.cfm) for PowerPC, but not recently as most of my development is ARM based.